A song to play while you’re reading about the Twins: “Sometimes It Snows In April,” by local hero Prince — because a series of home dates likely to be impacted by weather may set the course for this season. Also, it’s a reminder to Minnesotans to enjoy the beautiful summer days at Target Field while they last. For the 2019 season, the new(ish) Twins front office regime parted ways with their inherited manager, Paul Molitor. They moved from a local hero to someone with no ties to Minnesota, or even the Twins, in Rocco Baldelli. Baldelli has a very unique career arc in that he was a very top prospect whose playing career ended at age 29 due to injury. He then set about to have just about every job in the Rays organization: he worked in the front office as a special assistant for baseball operations, on the field as first base coach, and major league field coordinator. It is hoped that he will bring more than 2-percent of that Rays magic north. There is also hope for him to relate to some of the now post-hype prospects who can not yet be defined as busts (but are trending in that direction), especially Byron Buxton, Miguel Sano, and even one who has yet to sniff the majors in Nick Gordon. Baldelli’s on-field tendencies will be watched closely by those who have been frustrated by some of Molitor’s moves. But even more important will be the behind-the-scenes work we never really get to see, and that Baldelli has contributed to in his different capacities with Tampa. Will Baldelli and the front office (along with their teams of analysts and interpreters and coaches) be able to unleash the star potential we see in so many of the players in that dugout? That is the key question for the Twins’ 2019 season and beyond. In terms of wins and losses and the on-field product, the AL Central seems ripe for a rise and the potential for the Twins to be playing interesting and relevant games in September is definitely there. The question is simply how much winning can come before the Prince’s April snows return come October? What is the Twins’ most recent accomplishment? The Twins signed Nelson Cruz, 38-year-old slugger, to a 2019 deal worth $14 million with a club option for $12 million in 2020. This helps to fill a need at designated hitter and veteran presence after the retirement of Joe Mauer and the Twins’ decision to decline a club option on Logan Morrison. It is hoped that Cruz can maintain his consistency and also possibly mentor along some of the young Twins, especially fellow Dominican slugger Miguel Sano. 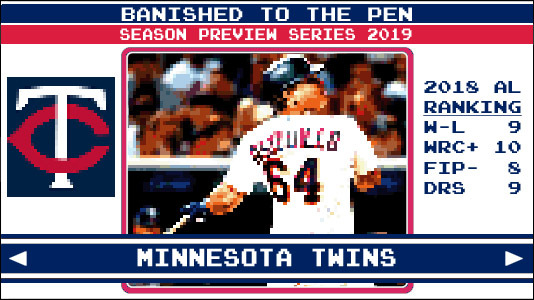 How will the Twins measure success in 2019? The Twins would count 2019 as a success if they are playing relevant games fighting for the second wild card (or possibly division) in September. The most Effectively Wild player on the Twins: <extremely Jeff Sullivan voice>Willians Astudillo! Willians Astudillo is clearly the most Effectively Wild player on the Twins because, it could easily be argued that Willians Astudillo is the most Effetively Wild player. Even with Jeff’s departure, “La Tortuga” brings the EW game to Target Field. His fun, his positional flexibility, and his lack of three true outcomes make him a hero to the masses. And, he combines that with being a very Twins player in that he MAY not even be on the Opening Day roster. Watch the prospects! It’s the Twins way. The Twins have announced a “Twins Pass” for 2019 – a subscription based plan that allows all-season access (excluding two big days – Opening Day and Joe Mauer Day) at three different price ranges. For $49 per month, fans get stadium access – read: standing room only. For $99 per month and $149 per month, fans get guaranteed access to an upper level seat or a lower level seat respectively. The seat will be different each day and released through a mobile app. This new structure to fan access promises to be an interesting experiment. Let’s hope it doesn’t follow the fate of its cinema-based predecessor: MoviePass. But now: who will pitch?